NFL commissioner Roger Goodell said today at the one-day owners meeting that he is going to sit down and “determine the next step” when it comes to letting Ben Roethlisberger rejoin the Steelers for offseason workouts. Goodell said that he would soon review the behavioural evaluation he ordered as part of his six-game suspension of the Steelers quarterback under the league’s conduct policy. The Steelers have been waiting on the commish to decide when the QB can return, and in the meantime have been giving most of their first-team snaps to Byron Leftwich, who is expected to start the season with Roethlisberger being suspended. 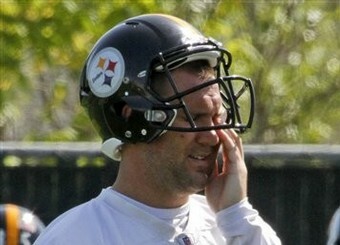 Be the first to comment on "Goodell says decision on Roethlisberger could be next week"